The Genova Asscher Cut Cubic Zirconia Cathedral Pave Solitaire Engagement Ring features a 1.50 carat 7mm asscher cut center diamond look cubic zirconia with pave set rounds that go halfway down both sides of the shank. 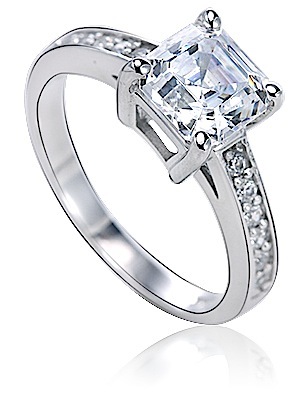 The cathedral style shank beautifully compliments the four prong basket set asscher cut center stone. All Ziamond Asscher cut diamond quality cubic zirconia stones are hand cut and hand polished by diamond cutters utilized from the original Russian formula to exact genuine diamond standards. 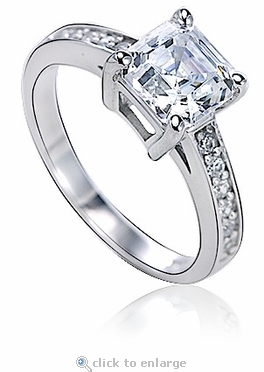 The Asscher Cut Cathedral Pave Solitaire includes approximately 2.25 carats in total carat weight and the shank on this engagement style ring measures approximately 2.75mm in width. Makes for a great stand alone solitaire or you can match it up with a complimentary band of your choice to make a fantastic wedding or bridal set.